Laura Ellis plays recent music inspired by events in the Bible, *three of the pieces commissioned for this recording. The music well demonstrates the spectacularly gratifying results of Reuter's 2015 renovation, revoicing, and replacing some ranks of the 99-rank instrument on five manuals, incorporating the remaining ranks of the 1925 E. M. Skinner and much of the subsequent work of Aeolian-Skinner and Möller. Writes Laura Ellis, "For the past few years, I have been intrigued by contemporary organ compositions which depict or “bring to life” scripture, liturgical actions, and sacred images. Music for the Testaments Old and New highlights works written by composers active in the United States from the mid-twentieth century to the current day." Rhythmic energy reflects David's exuberance in II Samuel 6:14—David danced before the Lord with all his might. This work takes its titles and inspiration from Psalm 150:3-5, where we are implored to praise God with various musical instruments. In each movement, the organ is asked to imitate the sound or gestures of these instruments. A Yemenite folk melody frequently used with this text in Hebrew is incorporated into several of the movements, as are fragments of chant melodies used in the High Holy Day services accompanying the blowing of the shofar. This composition chronicles elements of Jeremiah's journey: receiving the Revelation but resisting; being thrown into the cistern; preaching again in the midst of the chaos of a siege and ultimate fall of Jerusalem and the Temple. After lamenting the fall, Jeremiah becomes a prophet of Hope, the transformation. Leviticus 23:39—Howbeit, when you have gathered in the fruits of the lands, ye shall keep the feast of the Lord. Exodus 15:20—And Miriam took a timbrel . . .
Exodus 20:18—And the people perceived the thunderings and the lightnings and the voice of the horn and the mountain smoking . . . While having no specific biblical reference, this work provides an ideal transition from the prophecy of the Old Testament to its Christian fulfillment in the New Testament. In the beginning was the Word, and the Word was with God, and the Word was God. In him was life, and the life was the light of humankind. We have beheld his glory, glory as of the only Son from the Father. The composer shares that this work takes its inspiration from two sources: the Gregorian introit of the Mass for Christmas Day—Puer natus est nobis (“A boy is born to us”) and the rich sounds of the French organ. Because the first chapter of John is appointed as the Gospel reading for the Christmas Day Mass, each movement has a sentence or two of Biblical text that describes its affect. Luke 1:30, 31, 38—And the angel said unto her, Fear not, Mary: for thou hast found favour with God. And behold, thou shalt conceive and bring forth a son, and shalt call his name Jesus. RESURRECTION portrays in freely structured fragments the four aspects of the resurrection. Lament combines the liturgical mourning of the plainsong Vinea mea electa (O my vineyard, I planted and tended thee . . . and thou hast prepared a cross for my Savior) with an expression of contemporary grief. The Rising grows quietly from this grief, using twelve-tone rows and techniques to express its cosmic nature. The Ecstasy develops an alleluia strain with embellishments not unlike those used in the music of the Age of Aquarius. Reflection combines the liturgical rejoicing of the plainsong introit for Easter Day, Haec dies (This is the day which the Lord has made), with the alleluia fragments. Revelation 6:7-8—And when he had opened the fourth seal, I heard the voice of the fourth beast say, Come and see. And I looked, and behold a pale horse: and his name that sat on him was Death, and Hellfire followed with him. And Power was given unto them over the fourth part of the earth, to kill with sword, and with hunger, and with death, and with all the beasts of the earth. This work is based on two thematic references: the interval of the tritone (commonly known as “the devil in music”) and the Dies irae sequence of the Mass of the Dead. Herman Berlinski (1920-2001) received his early music education from the Landeskonservatorium Leipzig. He left Germany for Paris in 1933 and became a student at the École Normale de Musique, studying composition with Nadia Boulanger. Berlinski fled the German occupation of France and settled in New York City where, at age 50, he became the first person at the Jewish Theological Seminary of America to earn the Doctor of Sacred Music degree. Berlinski held the post of organist at Temple Emanu-El (New York City) and served as Minister of Music to the Washington (DC) Hebrew Congregation. A prolific composer, Stephen Paulus (1949-2014) wrote more than 600 works with great vocal and instrumental variety. In 2016, his works won Grammys in the categories of Best Contemporary Classical Composition and Best Classical Compendium. He was a recipient of both NEA and Guggenheim Fellowships and served as a Composer in Residence with the orchestras of Atlanta, Minnesota, Tucson, and Annapolis. In 1973 Paulus co-founded the Minnesota Composers Forum, now known as the American Composers Forum, the largest composer service organization in the United States. Paul Richards (b. 1969), Professor of Composition and Theory at the University of Florida, is the recipient of numerous prizes and commissions. His works have been heard throughout the United States and internationally on six continents. Awards include Special Distinction in the ASCAP Rudolph Nissim Prize, the Jacksonville Symphony Orchestra's Fresh Ink competition prize, and the New Music for Sligo/IMRO composition prize, among others. His works have been recorded by Richard Stoltzman, the Slovak Radio Orchestra, the Moravian Philharmonic, and numerous chamber groups. Keith Branson (b. 1956) is a Missionary of the Precious Blood of the Kansas City Province and has preached at parish missions in Iowa, Missouri, Illinois, and Indiana. Since ordination as a Roman Catholic priest in 2000, he has been a preacher, spiritual director, teacher, college administrator, pastor, and chaplain. From 2007-2012, he was Pastor at St. Ann Catholic Church in Warsaw, Missouri, and its mission of Sts. Peter and Paul in Cole Camp, Missouri. Now he is the Chaplain at Avila University in Kansas City, Missouri, as well as presenting parish missions, retreats, and days of reflection. Seth Bingham (1882-1972) was a widely respected American organist in the early twentieth century. He served on the faculties of Yale and Columbia, and lectured in the School of Sacred Music at Union Theological Seminary. In addition, he served as organist and choirmaster at Madison Avenue Presbyterian Church in New York from 1913-1951. Daniel Pinkham (1923-2006) was a versatile composer whose catalogue of compositions includes cantatas, oratorios, chamber operas, and symphonies. In 1990, he was named “Composer of the Year” by the American Guild of Organists. For many years he was music director at King's Chapel in Boston and was on the faculty of the New England Conservatory. A Prophecy is dedicated to the renowned organist E. Power Biggs and was commissioned by Harvard University for the series of dedicatory recitals on the 1967 Fisk organ built for Memorial Church. Born in Minneapolis and raised in Oregon, Joel Martinson (b. 1960) has lived in the Dallas, Texas, area since 1981. Having worked for both Christian and Reformed Jewish congregations, Martinson is currently Director of Music Ministries and Organist at The Episcopal Church of the Transfiguration in Dallas. Paul J. Sifler (1911-2001) was born in Ljublijana, Slovenia, emigrated to the United States at the age of eleven and became a US citizen. Sifler was a prolific composer and served as organist at St. Thomas Episcopal Church in Hollywood, California, and Temple Sinai, in Glendale. With John La Montaine, he founded Fredonia Press in 1975 and Fredonia Discs in 1977. Larry King (1932-1990) earned his undergraduate degree from the University of California/Redlands and did additional study at Union Theological Seminary and the Royal Academy of Music in London. In 1968, he assumed the position of organist and music director of historic Trinity Church, Wall Street, in Manhattan where he remained for twenty-one years. Stephen Montague (b. 1943) was born and educated in the US (Florida State University and Ohio State University). Since 1972, he has been living in Europe, first as a Fulbright Scholar in Warsaw (1972-74), then from 1974 in London where he works as a freelance composer, pianist and conductor. His works have been performed widely by such as the London Symphony Orchestra, Royal Philharmonic, BBC Symphony Orchestra, The National Symphony Orchestra (Washington, DC), Südwest­funk Symphony (Baden-Baden), and RTE Orchestra Madrid. Laura Ellis is an associate professor of music at the University of Florida in Gainesville. She teaches undergraduate and graduate organ, harpsichord, and carillon. In addition to her duties as university organist, she oversees the Andrew Anderson Memorial Organ in the University Auditorium, the carillon in Century Tower, and the historic keyboard instruments housed in the School of Music. A native of Minnesota, Ellis is a graduate of Luther College (Decorah, Iowa) and holds a Master of Music degree in church music and a Doctor of Musical Arts degree in organ performance from the University of Kansas. Prior to her Florida appointment, Ellis was on the faculty of McMurry University in Abilene, Texas, and served as parish organist at the Episcopal Church of the Heavenly Rest in Abilene. Ellis began her teaching career at the University of the Ozarks in Clarksville, Arkansas. A winner of the Gruenstein Memorial Organ Competition, Ellis is active as a recitalist and clinician. 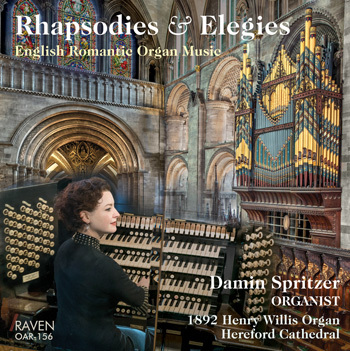 Recital engagements as organist have included appearances with the Jacksonville (Florida) Symphony, and at Piccolo Spoleto (Charleston, South Carolina), Westminster Abbey, University of Sydney, and locations in Florida, Texas, and the South. As a member of the American Guild of Organists, Ellis has served the guild as chapter dean, district convener, director of the New Music Committee, and Southeast Regional Councillor. Information on the organ program at the University of Florida may be found at www.arts.ufl.edu/organ. The University Auditorium was built in 1922-24. Designed by William Augustus Edwards (1866-1939) of Atlanta, it was the first built of several structures he planned as an administrative cluster for the University of Florida campus. His design for the campus included 14 buildings constructed beginning in 1907. Adjacent to the Auditorium is Century Tower, not constructed until 1953-56. At 157 feet in height, it is Edwards’ central visual element of the campus and contains the carillon of 49 cast bronze bells built in 1979 by the Royal Eijsbouts bell foundry of Asten, Netherlands. It was enlarged to 61 bells in 2003. Architect Edwards employed a ham­mer­beam ceiling (photo on back cover) for the University Auditorium. A carved figure at the end of each ham­mer­beam represents a scholar of arithmetic, music, geometry, or astronomy. He designed an elaborate organ facade that was not built. Philanthropist Dr. Andrew Anderson provided funds in 1924 for the Skinner Organ Co. to build the 61-rank organ of four manuals for the auditorium, first heard during a bac­caulaureate service on June 7, 1925. Later that afternoon, Skinner company vice-president William E. Zeuch performed the dedication recital. Claude Murphree, university organist 1925-1958, performed more than 550 concerts on this organ, his Sunday afternoon recitals becoming a tradition. Willis Bodine succeeded Murphree as university organist in 1959, retiring in 2003. Bodine arranged renovation of the organ during 1965-1970 by the Aeolian-Skinner Organ Co., including a new Great Division and rebuilding the Swell and Pedal Divisions. In 1978, the M. P. Möller Co. was engaged to rebuild the instrument, returning 1988-1992 to add the Choir and Bombarde Divisions and thus expanding the organ to five divisions of more than 5,300 pipes in 99 ranks as played via a five-manual console. Laura Ellis joined the UF faculty in 2003 to become the third university organist in the history of the institution. The Reuter Organ Co. completed a comprehensive tonal revision of the organ in January, 2015, resulting in 99 ranks on five manuals. The University of Florida Campus Historic District contains eleven buildings listed by the National Register of Historic Places and six contributing properties on about 650 acres of the campus of more than 2,000 acres. In 1905, the Florida legislature consolidated four institutions to become the University of the State of Florida, which adopted the founding date of its earliest precursor, 1853. Gainesville was selected as home to the university, and the first buildings were completed for occupancy in the 1906 academic year. The name was changed to the University of Florida in 1909.